Herogues version 0.3414 is here with new enhancements, features, and bug fixes. You found out that a small town in Kara's Vale called Lanecrost has come under attack at night. There have been strange sightings of creatures stirring in the shadows. Shortly after your arrival, you realised the source wasn't inside the town but instead in the catacombs below. Draw your weapon and bring some light! Squash giant rats and smash goblin scum! For glory and fame! However, perhaps you just want the riches. Herogues is a roguelike that follows a traditional path of a turn-based adventure, but it feels like an action rpg when played. It combines old-school and modern styles for a unique experience. 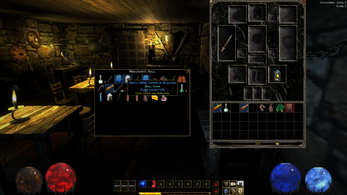 Every playthrough is different as the dungeons and items are procedurally generated. You play as a hero who takes it upon themselves to delve into a dungeon near a tiny town. Your quest is to protect the town and find out what or who is causing this darkness to seep into the light. There are hundreds of items to help you in your quest, you just have to find them. Also, you want the gold. This is an early access release. If you decide to purchase, you will have access to all future versions as well as the final release. Please keep this in mind when buying the game as it still needs polish and balancing. Requires a 3D card to play.